After Martha Stewart’s conviction, the prospects of the company she founded and built, Martha Stewart Living Omnimedia, looked bleak. By tying her personality so closely to that of the company’s many lines of business, Stewart and her management team left the whole enterprise vulnerable. There’s plenty we can learn from the rise and potentially avoidable fall of this brand icon. 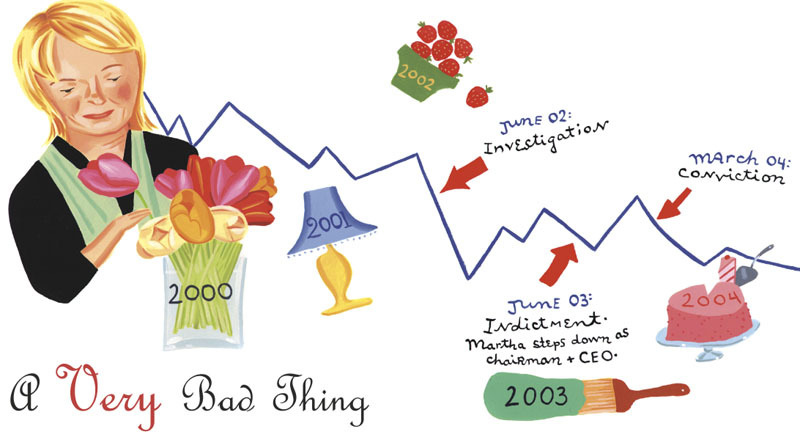 n March 5, 2004, Martha Stewart was convicted of conspiracy, obstruction of justice, and lying to investigators who had been probing her stock sales in biotechnology company Imclone. Earlier that day, amid speculation she would be acquitted, stock in Martha Stewart Living Omnimedia (MSO) traded as high as $17. Soon after her conviction, the stock sank as low as $9.25. The damage to the Martha Stewart brand cost her company 46 percent of its total value – or $433 million. Martha’s legal travails have been thoroughly dissected. But their impact on the company’s brand has received less attention. Did the company have to lose 46 percent of its peak value that day based on a single conviction? No. Did the company have a sound branding strategy in place at the time? No. Was there something the company could have – and should have – done differently to avoid suffering such a huge impact as a result of Martha’s guilty verdicts? Yes. Martha Stewart’s ascent to lifestyle impresario began with the publication of her 1982 book Entertaining. In 1991, she launched Martha Stewart Living with the support of Time Publishing Ventures. Throughout the 1990s, the indefatigable lifestyle expert expanded into several other businesses as she became a television star and syndicated columnist. In 1997, she bought her freedom and the rights to all of her businesses from Time Publishing Ventures for $53 million. In short order, she launched a website, a radio program, and more television programming. Most important, she began selling licensed merchandise through K-Mart. When her company went public in 1999, its assets were impressive: two magazines, Martha Stewart Living and Martha Stewart Weddings; two television programs, the syndicated “Martha Stewart Living” television show, available in 90 percent of U.S. homes, and “From Martha’s Kitchen” on the Food Network; Martha Stewart’s 27 books; the askMartha radio program, reaching 1.5 million listeners each weekday; the askMartha syndicated newspaper column, reaching 43 million readers each week; a website, MarthaStewart.com; and licensed merchandise, including bed and bath products, paint, furniture, and garden tools. Unfortunately, there was never a serious attempt to implement such a strategy. The company continued to practice the easy strategy of “All Martha, All the Time.” And so when the guilty verdicts came in, the company was seriously wounded. And in the wake of the verdict, many openly wondered about its long-term survival. Branding is primarily about owning a distinctive and valuable spot in your customer’s thought. One simple approach to achieve such distinctiveness is to develop a personal brand. Essentially, a unique individual imbues the brand with all of her personal characteristics. Yet, as MSO acknowledged back in 1999, this easy strategy risks sudden demise if that person’s reputation is damaged. By contrast, the harder yet more enduring way to develop a distinctive brand is to start by identifying the attributes that your customers value. Then, if the company can perform on those attributes and communicate that performance, customers begin to associate your brand with those attributes. Differentiating Martha Stewart as a personal brand was relatively easy. But it would have been much better if the company had developed an impersonal brand that was synonymous with a certain lifestyle – stylish, aspirational, and up-scale. The Disney brand thrives today, nearly 40 years after its founder’s death, because it came to mean so much more than the person Walt Disney. Martha Stewart should have had her company develop brands and distinctive values that transcended her alone. It’s likely that the astonishing success of MSO’s personal-brand approach blinded the company to the longer-term potential of the impersonal-brand approach, in which the company is tied more closely to key attributes than a single person. The value of these key attributes would likely have stood the test of time much better than the value of one individual. Even if Martha Stewart had not committed crimes, it’s likely that her personal appeal would have fallen out of fashion eventually. So, what prevented MSO from implementing an impersonal branding strategy, when the company acknowledged that it was important to do so? Perhaps the early success of the company fed the hubris of its founder and fostered a cult of personality within the company. Or perhaps Stewart and her management team simply didn’t know how to shift towards a less personal branding strategy. There are a series of integrated steps that MSO – or any other company – could take to build an impersonal brand portfolio. First, determine the attributes that deliver value to your customers. Then, based on the company’s current strengths and strategy, decide which attributes you want to own, and devote resources to capture them. Just as FedEx is tied to reliable overnight delivery, and Disney is tied to family entertainment, MSO could have tied itself primarily to stylish, aspirational, up-scale living – much as Ralph Lauren has done. Then, its efforts could have been directed toward reinforcing associations with these attributes, rather than associations with Martha Stewart. This approach creates value in a company, rather than value in a personal brand. Second, adapt brand names over time. As one example, the magazine Martha Stewart Living could have been re-titled Living by Martha Stewart, and eventually just Living. Over time, Living could have been tied to those attributes the company wanted to own. Then, should Martha Stewart “the person” encounter problems, Living “the brand” could live on. Advertisers wouldn’t have run from a magazine called Living as quickly as they ran from a magazine named for a convicted felon. Third, introduce sub-brands (part 1). In MSO’s magazines and television shows, it would have been very easy to introduce guest experts in a variety of areas – gardening, cooking, decorating, etc. The best guest experts could then have been turned into regular features. In the best-case scenario, some could have even been spun off into their own television shows and magazines. And MSO could have owned the rights to these new properties. Of course, such a strategy would have been a big divergence from “All Martha, All the Time.” In contrast, Oprah Winfrey’s success in launching the Dr. Phil television show demonstrates how such a strategy could have been implemented. Fourth, introduce sub-brands (part 2). Licensed merchandise presented another opportunity for developing sub-brands. With such a wide variety of licensed merchandise, different attributes are relevant for different products. Therefore, the company could have developed brands for different groups of products: one brand for kitchen products and a second brand for bed and bath products. Over time, these sub-brands could have been converted to primary brands. From the time it went public in 1999, MSO realized the importance of moving away from Martha Stewart the person. Unfortunately, it now faces the task of doing so, out of necessity, and with a dramatically weakened brand. The best future opportunities to diversify are likely to be with licensed merchandise, because the appeal of these products has relatively more to do with the products themselves than with Martha Stewart the person. In contrast, the media properties, especially television, are much more closely tied to Martha Stewart herself. After the verdict, stations dropped her television shows and newspapers dropped her columns. The flagship television program went from reaching 90 percent of U.S. households to only 50 percent. More recently, the company announced that her main syndicated television program would take a hiatus for the 2004-2005 season. The impact on magazines is substantial, but not quite as bad as television. Earlier this year, Martha Stewart Living reduced its guaranteed circulation from 2.3 million to 1.8 million. Even more important, advertisers fled. Total ad pages dropped from 1,887 in 2002 to 1,234 in 2003. While the impact on merchandise has been minimal thus far, it’s likely that a reduced media presence will eventually lead to lower revenue here too. MSO has to hope that eventually its branding strategy can take precedence over Martha’s legal strategy. Even now, the Martha Stewart brand is likely the most valuable asset of the company. Thus, it has to hope that Martha Stewart the person can help to revive Martha Stewart the brand. Whether or not her convictions are upheld, Martha Stewart must find a way to re-connect with her customers in a way that incorporates and subsumes these legal events into the public’s broader perception of her. For Martha Stewart herself, the optimal strategy is to continue to fight the legal battle. Yet, this personal strategy is at odds with the best brand strategy. The right brand strategy will likely incorporate acknowledgment of her conviction, contrition, and an appeal for forgiveness. The sooner this strategy is implemented the better. Then MSO can begin to diversify its brand portfolio from the strongest possible base. People may be willing to wait to forgive the person, but they won’t wait to forgive the brand. Peter N. Golder is associate professor of marketing at NYU Stern. He wishes to thank Alina Dijur, MBA ’04 and Cecilia Dones ’04, for their research assistance in preparing this article.